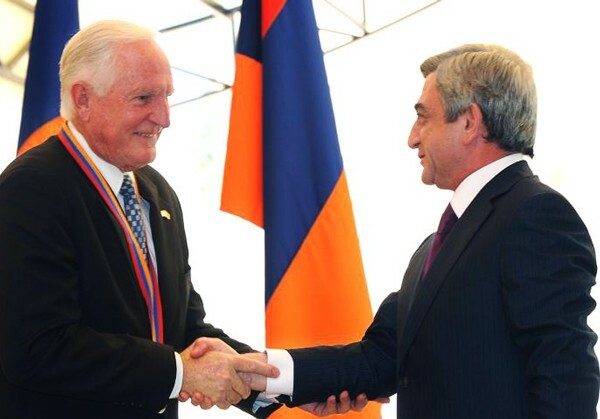 Awarding ceremony of Global Award of the President of the Republic of Armenia for Outstanding Contribution to Humanity through IT took place today, at the presidential office. The Award of the President of RA for 2009 is given to Craig Barrett, retired CEO/Chairman of the Board of Intel Corporation. “Dear Mr. and Mrs. Barrets, Dear Ladies and Gentlemen, I’m glad to welcome Mr. Craig Barrett who has been the CEO and president of Intel Corporation for years, and his wife. Today in Yerevan for the first time we grant our Global Award for Outstanding contribution to Humanity through IT to Mr. Barrett. Intel Corporation and Craig Barrett himself doesn’t need any introduction. Everybody who starts his day with turning on computer is aware of these names. This award is a humble contribution of the Republic of Armenia to the development of Global IT. We honor Dr. Barrett through this and appreciate the contribution of Intel Corporation in spreading High-Tech and knowledge to every corner of the world. The spread of Information Technologies is really important. Perhaps one of the most important achievements is the ease of information and knowledge, and the raise of the literacy level worldwide. Information Technologies make a real revolution in these two spheres. 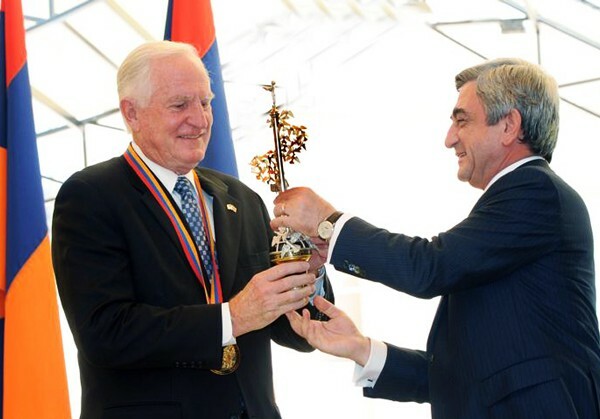 The most important purpose for the creation of this award is the raise of the attention of the youth of Armenia to IT. We will encourage their education and work in this sphere, will search and find new ways and means for that. Today, in the presence of Craig Barrett, once again we address our message that the future belongs to people with knowledge, kindness and creativeness, people who relies on the power of his mind and possesses problem solving skills to our youth. We are independent, smart and entrepreneur people: That’s why we have the assets for the IT sphere – idea and talent. And these assets make miracles because no production-line or computer program can surpass the creativeness of a human individual. We have an unlimited potential for the development in this sphere. It is worth noting that Mr. Barrett hasn’t been enrolled only in Information Technologies. Exploring his bio we can note that along with his main work he was the chairman of the United Nations Global Alliance for Information and Communication Technologies and Development. At the same time he was actively involved in implementation of several national projects in USA, was an appointee of the President’s Advisory Committees. Introducing Mr. Barrett people usually characterize him as a leading advocate for improvement of education worldwide, as a person, who could always look forward and insist that the future belongs to knowledge. This is my vision of an entrepreneur of nowadays. I want the entrepreneurs of Armenia to think about this example. I wish that all our entrepreneurs would be alike. I’m not talking about the charity only. I’m talking about the responsibility towards society in general and the need of refusing of short-term and transitory income in the case of serious public damage. I’m talking about the ability to resist the temptations such as greed and arrogation. I’m glad to state that there exist such entrepreneurs in Armenia, and there are a lot of them. Of course I don’t mean the quantity, but just the approach. 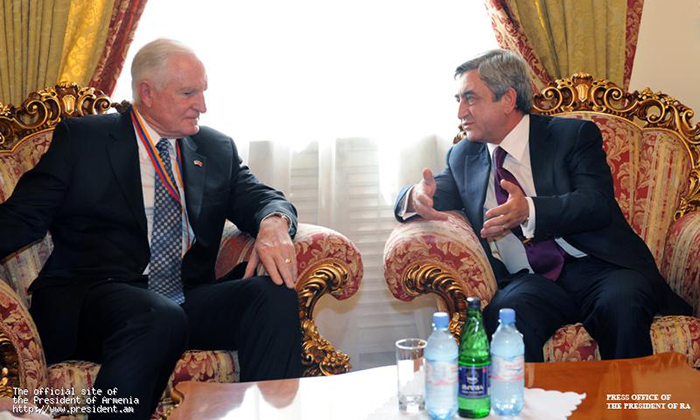 I want to express my appreciation to Armenian branch of Synopsys Inc. and its CEO Rich Goldman. 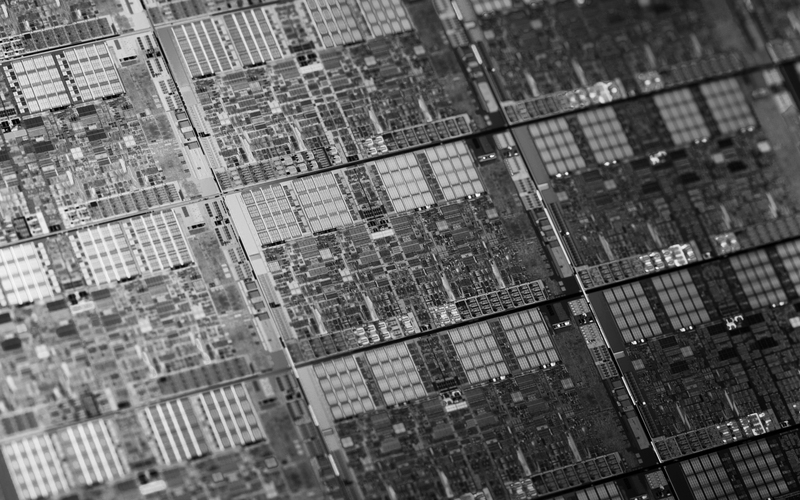 From the very beginning, Synopsys and Rich Goldman himself were actively involved into the realization of the concept of this award. I also want to express my gratitude to the co-chairmen of the award committee, members of advisory, executive and selection panels, as well as all those people who contributed in the realization of this idea. 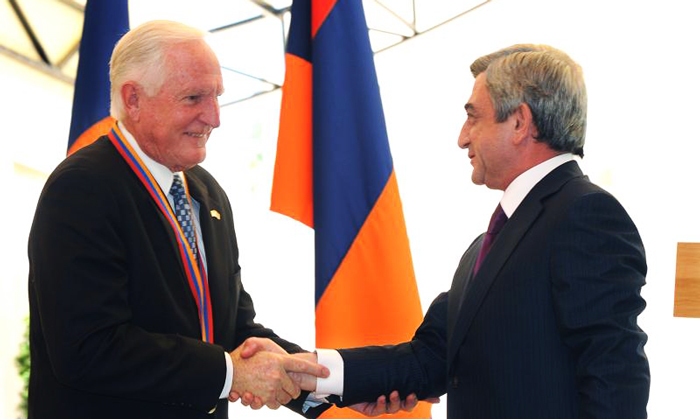 I am happy to see you in Yerevan. I hope you will have a chance to get acquainted with Armenia, our history, culture and come to love Armenia and Armenian people. And we always look forward to host our friends and are ready to pass on our love, respect and warmth to them. Mr. and Mrs. Barrett, I am happy to see you today and thank you for coming. Craig Barrett, when received the award, said, “It’s a pleasure to me to be here and introduce the industry’s all leading and outstanding persons, who launches wonderful technologies. 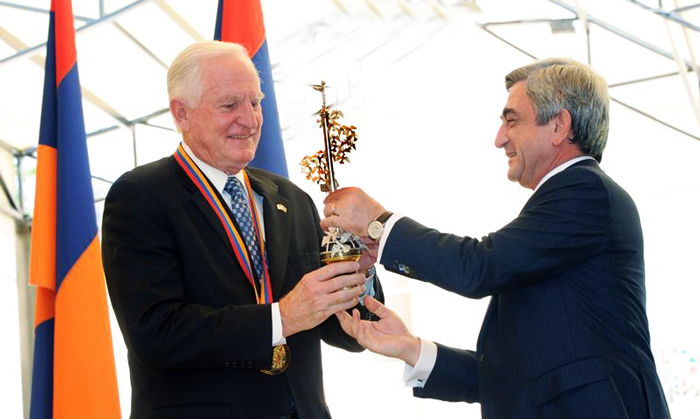 It’s a pleasure to be in Armenia and become the first laureate of the award. I am here not as an individual, but I am presenting thousands of people, who has contributed a lot to the IT sector over tens of years advancing them and bringing to the current state”. According to Craig Barrett, as the years pass, the IT sector’s impact to all aspects of life increases. It especially promotes economic development, greatly influences on the areas of medicine and education. Also, year after year the role of IT in insuring productivity of management systems and publicity increases. 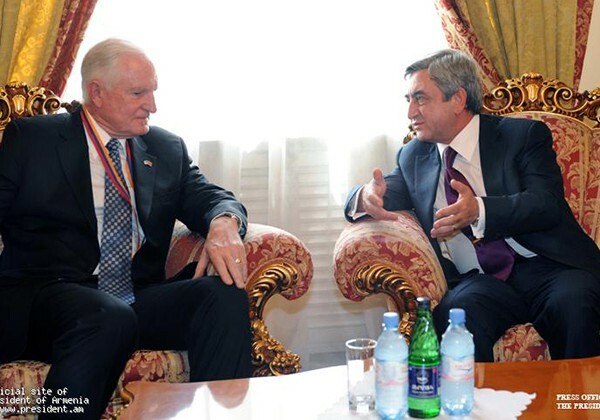 After the awarding ceremony, the President Serzh Sargsyan had a private dialogue with Craig Barrett, after which there was served the lunch in honor of Mr. and Mrs. Barretts. 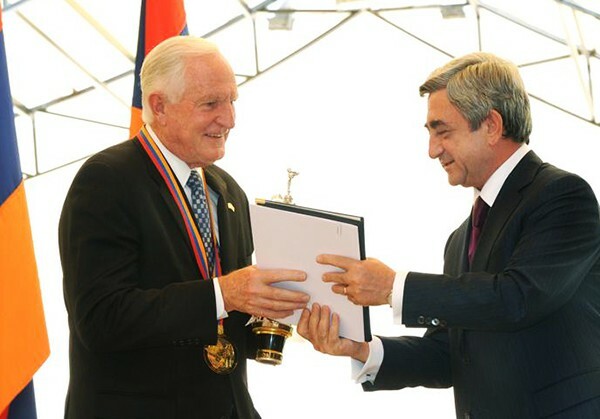 On July 6, 2009, President of the Republic of Armenia Serzh Sargsyan issued a Decree establishing a Global Award of the President of the Republic of Armenia for Outstanding Contribution to Humanity through IT. Its goal is to stimulate the growth of this sphere. The GIT Award is granted on an annual basis to people whose outstanding contributions in this sphere either in technological, educational, organizational, or financial areas have resulted developments in IT sphere. Laureate is selected by Awarding committee and international Selection panel determined by the President. 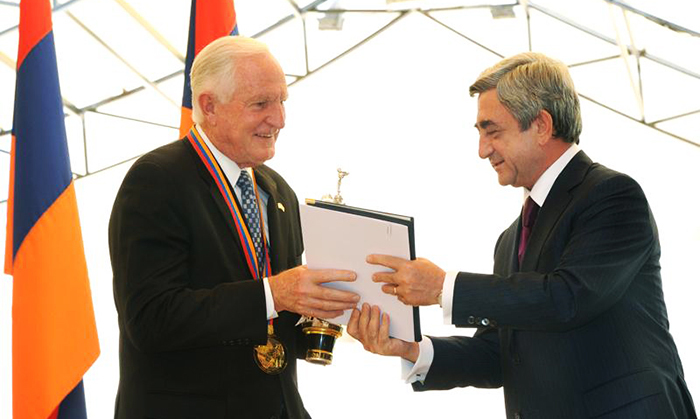 The award consists of a Gold Medal, Diploma and trophy evoking Armenia and high tech. 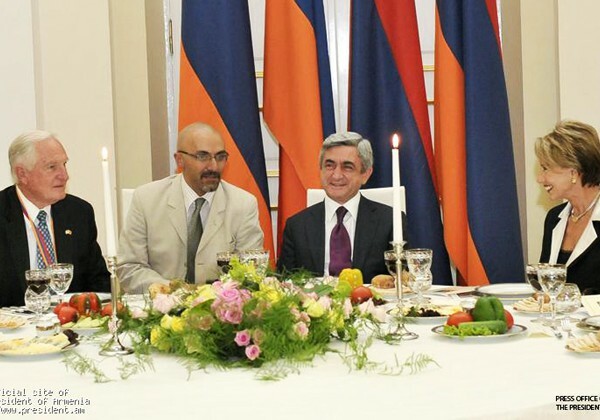 Financing is provided in accordance to memorandum of agreement signed between Hayastan All-Armenian Fund, Synopsys Armenia CJSC and a sponsor. 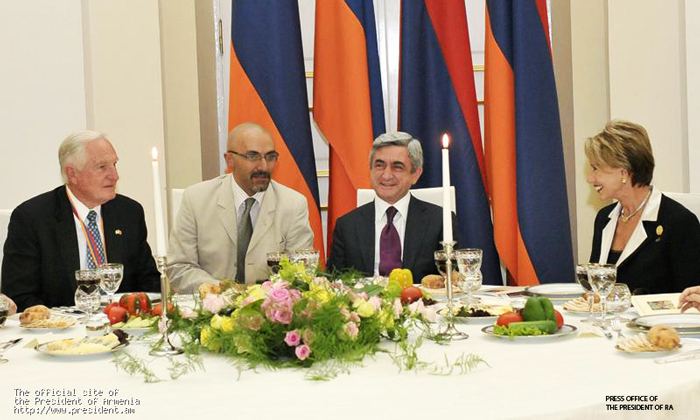 Financing for 2009 year is provided by VivaCell MTS through Hayastan All-Armenian Fund.